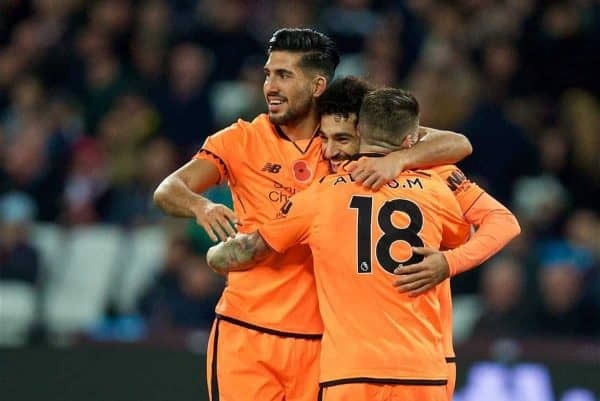 Liverpool saw off West Ham at the London Stadium with a show of pace, technique, and managerial guile which included a notable change of tactics. 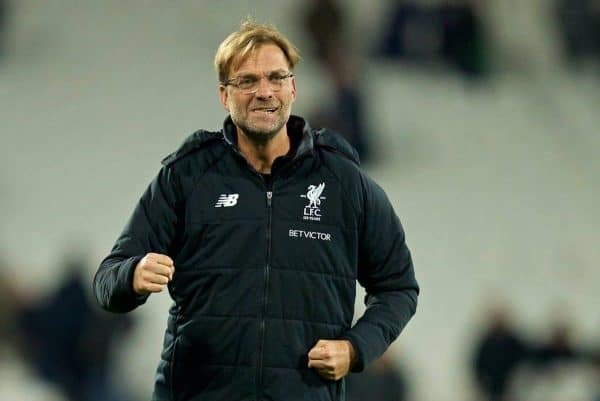 Much has been said about the change, not least by Jurgen Klopp himself, and what follows is an attempt to get to the bottom of it and how it helped the team pick up the victory in east London. 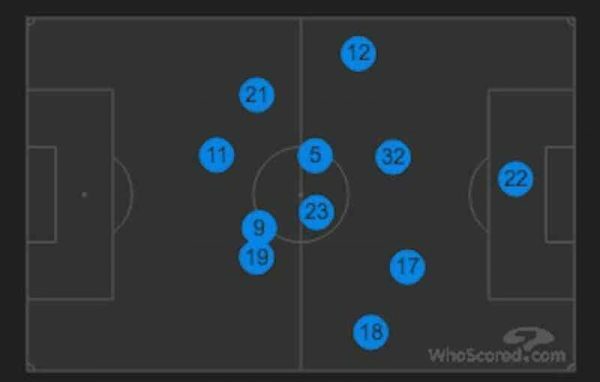 The formation used by the manager during the game has been described using a whole host of strings of numbers, labels and lofty comparisons. It certainly got people talking about tactics and systems, which is always a good thing! The manager spent a good portion of his post-match press conference talking about the formation which he himself referred to as 4-4-2, while Steven Gerrard, who probably has a reasonably good idea about what systems Klopp uses in training, also called it a 4-4-2 when speaking on BT Sport. This is Anfield and the Guardian’s Sachin Nakrani then tidied up the loose ends in this article, which gave the best overview. 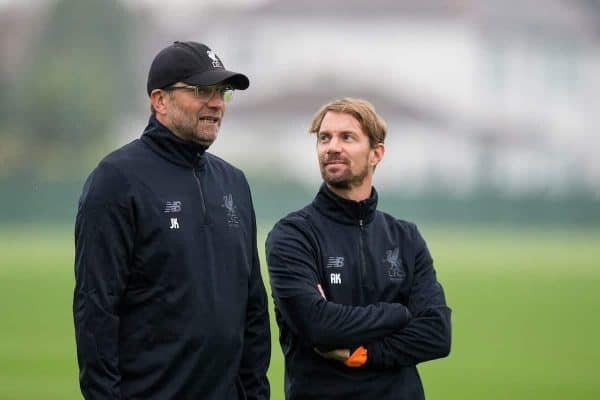 It combined the thoughts of Klopp and Gerrard, as well as personal observations from the game itself and references back to that Dortmund team. But who better to hear from than the man himself? Liverpool’s manager spoke at length about his tactics after the game, and here are some of his comments relating to his new system. “Changing the system without proper training; yesterday was the first time we did it, the 4-4-2, which looked maybe from the beginning like a very offensive lineup,” he said. “We actually had a different idea. We wanted to defend deeper, more compact, using the space which we have then for the counter-attacks. “We will never know how it would have been if we don’t score the first goal, but it was kind of an open game until then. We have to get used to it. It’s difficult for the boys to wait a bit more for the challenge than jump always. “We scored the first one: fantastic counter-attack. We scored the second one: second set-piece goal in one week. I don’t think I’ve had that since I’ve been at Liverpool, so that’s really special. I had two set-piece goals in one week, or maybe more, but from the other side! “Response [to their goal] was outstanding. Fantastic situation from Roberto Firmino, he thought lets run in this direction and pass the ball to Ox. 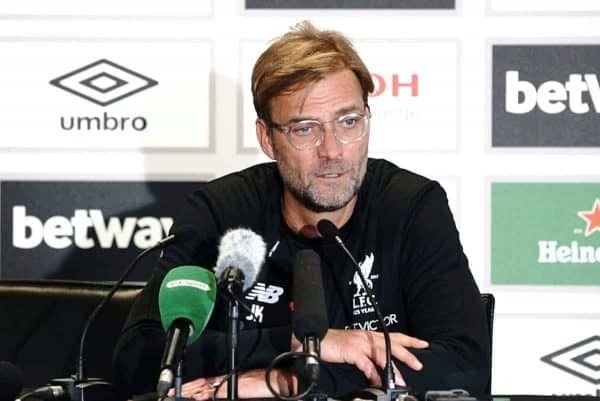 Klopp said that one of the reasons for the change was to protect the defence and avoid situations like those which occurred in the loss to Spurs. The new formation was designed so that every player could help the other and minimise the occasions where one mistake from one player leads to a chance. “It was not a centre-half who made the mistakes [against Spurs], it was the centre-half who lost the header, so we have to change that. “And that was one of the things we did a lot since then, and that’s one of the reasons why we changed system today. “As I said it looked like a very offensive lineup but it was a very defensive lineup. He spoke about playing Mohamed Salah in the striker role, which was a key change in this setup. “He is a real goal threat, he’s an offensive midfield player which is more a striker, that’s true. “Today he had the position and obviously he likes it,” Klopp concluded. The willingness to play deeper inadvertently helped the team become more attacking. As Klopp himself said it was supposed to be a defensive switch, but instead it ended up liberating Liverpool’s attacking quartet. The space on the counter was available both through attacking after a turnover in possession and when pressing after the opposition had won the ball themselves. 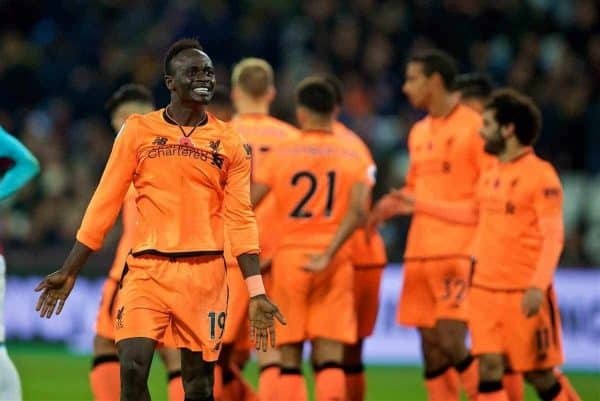 A deeper team unit and more defensive-minded full-backs on both flanks allowed for the setting of traps across the pitch—a contrast to the failed counter-pressing attempts in recent times where Liverpool’s snares have been in full view and ineffective as a result. The 4-4-2 often became 4-2-4 when counter-pressing, and the two central attackers meant that the opponents had less time on the ball in the middle of the park than they would have liked. 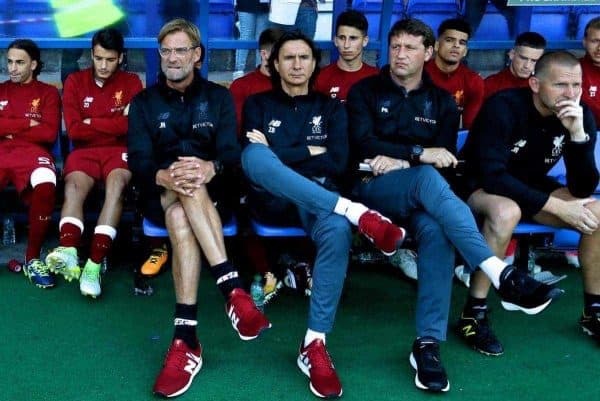 Klopp didn’t mention the pressing in his post-match press conference, but he will no doubt have been pleased with the effect this formation change had. It delivered a sheet of four pressers up front supported by another, albeit more conservative, line of four from the full-backs and midfielders behind them. Team shape can be dictated as much by the opposition as it is by any pre-match instruction from the manager, and West Ham’s three centre-back setup helped Liverpool’s wide players operate more like wingers than the wide midfield roles they may have expected to be playing. When attacking, wing-backs Aaron Cresswell and Edimilson Fernandes could be monitored by Klopp’s full-backs, Joe Gomez and Alberto Moreno, with help from the two deep-lying midfielders. Problems arose when either Andre Ayew or Manuel Lanzini moved into the channels, but this wasn’t a regular occurrence. This meant that the two players down to play the wide midfield roles in the middle four were regularly able to move forward and join the two attackers forming a four up front rather than in midfield. This led to the 4-2-4 shape, and when the full-backs were nudged forward alongside the two central midfielders, it became a 2-4-4 when attacking. This formation aids the transition from defence to attack and keeps things solid in the event that the opposition win the ball back. In theory, it should lead to fewer errors from opposition counter-attacks than the 4-3-3. The transition game, or umschaltspiel in Klopp’s native tongue, was used at Dortmund to great effect as the side wait to pounce on opposition errors, but it can also help keep possession when required. The big caveat to all of this is that it was only West Ham, but in the past Liverpool have sometimes found those sides struggling down at the bottom difficult to beat, so perhaps this shouldn’t be dismissed so easily. Bigger tests await Klopp’s side, not just at home but in Europe as they look set to qualify for the knockout rounds of the Champions League. It is in these high-profile games which define a season, where formations, tactics, players and manager will really be judged, but if they are successful then it’s worth remembering the games where new ideas were first tested. This particular new system has certainly passed its initial examination.